Each week the PC Gamer team grinds for gear that gives them a +10% chance of delivering critical hot takes. I’m actually quite excited about Borderlands 3. 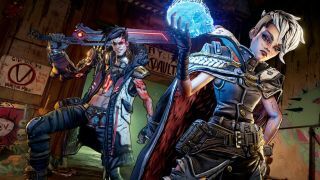 It looks like it won’t shake up the Borderlands formula too much, and visually it seems very close to the six-year-old Borderlands 2. But! I really want a dedicated co-op shooter that I can enjoy with friends without it turning into a grindy service game—I have Destiny for that. Give me some colourful not-brown planets to shoot up, and give me some nice loot, and I will happily chew through the experience content in the knowledge that it will, one day, end. After four DLC “content packs” of course. This week I accidentally got addicted to a hunting game. I reviewed The Hunter: Call of the Wild back in 2017 and gave it 60%, which I still stand by because the missions are pretty badly designed and the pace is often intolerably slow. But something drew me back to it, and this week I've put almost 25 hours into the thing. The main reason I'm hooked are the environments, which feature some of the most atmospheric forests I've ever seen in a game. It's a really peaceful experience, scratching the same weird itch as Euro Truck Simulator 2, and I'm genuinely loving creeping through the bushes looking for buck turds. World Tier 5 hit The Division 2 this week, which sounds like absolute nonsense to anyone not well-versed in the Clancy looter shooter. It basically means another major piece of its endgame has been added as part of a major update, bringing with it a brand new Stronghold, which is the game's version of dungeons. I took an hour this afternoon and blasted through it, and it's another cool addition to a game that seems to have a long and healthy life ahead of it. I enjoy a good homage, and this Total Warhammer 2 DLC trailer is a great one, recreating the scene from Predator where, as Andy put it, "the team blows up seven percent of the Amazon rain forest." I don't play Total Warhammer 2 but this trailer reminded me I hadn't yet seen last year's Predator movie (The Predator), so I watched it last night. And it was awful! Just a huge turd of a film. So I'm going to watch the original Predator tonight just to wash the bad taste out of my mouth. The original is not awful! It's great. Ever since Bloodlines 2 was announced, I haven’t been able to shut up about it, both on and off the site. I’ve talked it about endlessly with my fellow horror fans and vampire lore junkies. I’ve gone back and started playing Bloodlines again for, what, the tenth time now? With my ever-diminishing free time, I’ve had to be extra choosey about what games I play, especially if they have long campaigns. I won’t finish them if I’m not absolutely in love with them, but I think Bloodlines 2 might be that next game for me—the one where I put my phone on silent and lock myself in my room for days on end until someone send the cops to my apartment for a welfare check. Besides, Bloodlines 2 will support ray tracing. Maybe RTX prices will have gone down by the time the game releases. I’ve been waiting for an excuse to upgrade to an RTX GPU. I'm not sure if this is a high or low. I was very close to completing an infinite combo deck in Slay the Spire, which would've taken me to the end of it, but I died before I could get the last missing piece (if you're wondering, the deck involves using Tactician, lots of draw and discard, and free attacks). I was very sad. And then I sort of ruined the game for myself by trying to recreate that deck in every subsequent run rather than building a deck based on what's presented to me, which is what makes Slay the Spire fun. It felt great to get so close to perfection, though. If I stop for a few days and go back to Slay the Spire, maybe I'll finally have moved on from trying to recreate my near victory. Point is: I love this game. It's my GOTY right now, and I will not stop until I've fully beaten it.